The ancient philosopher, Heraclitus, maintained that everything is in a state of flux. Nothing escapes change of some sort (it is impossible to step into the same river). On the other hand, Parmenides argued that everything is what it is, so that it cannot become what is not (change is impossible because a substance would have to transition through nothing to become something else, which is a logical contradiction). Thus, change is incompatible with being so that only the permanent aspects of the Universe could be considered real. An ingenious escape was proposed in the fifth century B.C. by Democritus. He hypothesized that all matter (plus space and time) is composed of tiny indestructible units, called atoms. This idea seems motivated by the question of how finely one can go on cutting up matter. While Democritus performed no experiments and had only the flimsiest evidence for postulating the existence of atoms, his theory was kept alive by the Roman poet Lucretius which survived the Dark Ages to be discovered in 1417. The atoms in Democritus theory themselves remain unchanged, but move about in space to combine in various ways to form all macroscopic objects. Early atomic theory stated that the characteristics of an object are determined by the shape of its atoms. So, for example, sweet things are made of smooth atoms, bitter things are made of sharp atoms. In this manner permanence and flux are reconciled and the field of atomic physics was born. Although Democritus' ideas were to solve a philosophical dilemma, the fact that there is some underlying, elemental substance to the Universe is a primary driver in modern physics, the search for the ultimate subatomic particle. It was John Dalton, in the early 1800's, who determined that each chemical element is composed of a unique type of atom, and that the atoms differed by their masses. He devised a system of chemical symbols and, having ascertained the relative weights of atoms, arranged them into a table. In addition, he formulated the theory that a chemical combination of different elements occurs in simple numerical ratios by weight, which led to the development of the laws of definite and multiple proportions. He then determined that compounds are made of molecules, and that molecules are composed of atoms in definite proportions. Thus, atoms determine the composition of matter, and compounds can be broken down into their individual elements. The first estimates for the sizes of atoms and the number of atoms per unit volume where made by Joesph Loschmidt in 1865. Using the ideas of kinetic theory, the idea that the properties of a gas are due to the motion of the atoms that compose it, Loschmidt calculated the mean free path of an atom based on diffusion rates. His result was that there are 6.022x1023 atoms per 12 grams of carbon. And that the typical diameter of an atom is 10-8 centimeters. Matter exists in four states: solid, liquid, gas and plasma. Plasmas are only found in the coronae and cores of stars. The state of matter is determined by the strength of the bonds between the atoms that makes up matter. Thus, is proportional to the temperature or the amount of energy contained by the matter. The change from one state of matter to another is called a phase transition. For example, ice (solid water) converts (melts) into liquid water as energy is added. Continue adding energy and the water boils to steam (gaseous water) then, at several million degrees, breaks down into its component atoms. The next great step forward in the understanding of atoms was accomplished by John Thomson. Using a cathode ray scope, Thomson determined that all matter, whatever its source, contains particles of the same kind that are much less massive than the atoms of which they form a part. They are now called electrons, although he originally called them corpuscles. His discovery was the result of an attempt to solve a long-standing controversy regarding the nature of cathode rays, which occur when an electric current is driven through a vessel from which most of the air or other gas has been pumped out. By applying an improved vacuum technique, Thomson was able to put forward a convincing argument that these rays were composed of particles. Furthermore, these rays seemed to be composed of the same particles, or corpuscles, regardless of what kind of gas carried the electric discharge or what kinds of metals were used as conductors. From these ideas he developed the idea that atoms are made of negative electrons embedded in a gel of positive charge (a "plum pudding" model). Thomson's conclusion that the corpuscles were present in all kinds of matter was strengthened during the next three years, when he found that corpuscles with the same properties could be produced in other ways; e.g., from hot metals. Thomson may be described as "the man who split the atom" for the first time, although "chipped" might be a better word, in view of the size and number of electrons. Ernest Rutherford is considered the father of nuclear physics. Indeed, it could be said that Rutherford invented the very language to describe the theoretical concepts of the atom and the phenomenon of radioactivity. Particles named and characterized by him include the alpha particle, beta particle and proton. Rutherford overturned Thomson's atom model in 1911 with his well-known gold foil experiment in which he demonstrated that the atom has a tiny, massive nucleus. By the turn of the 20th century, physicists knew that certain elements emitted fast moving particles of two flavors, alpha particles and beta particles. These elements were typically very heavy (i.e. their atom nuclei were massive) such as uranium and radium. Today we know that heavy nuclei are unstable and `decay', meaning that they spontaneously split into smaller nuclei and emit stray particles. This is called radioactivity. The Rutherford beamed alpha particles through gold foil and detected them as flashes of light or scintillations on a screen. The gold foil was only 0.00004 centimeter thick, meaning on a few hundreds of atoms thick. If the Thomson model of atoms was correct, then the alpha particles should pass through with relatively little deflection. The expectation is that they will strike the fluorescent screen directly behind the foil. Most alpha particles were observed to pass straight through the gold foil. A few, however, were scattered at large angles, and some even bounced back toward the source. Only a positively charged and relatively heavy target particle, such as the proposed nucleus, could account for such strong repulsion. These results can best explained by a model for the atom as a tiny, dense, positively charged core called a nucleus, in which nearly all the mass is concentrated, around which the light, negative constituents, called electrons, circulate at some distance, much like planets revolving around the Sun. The Rutherford atomic model has been alternatively called the nuclear atom, or the planetary model of the atom. One of the primary goals in modern physics is to answer the question "What is the Universe made of?" Often that question reduces to "What is matter and what holds it together?" This continues the line of investigation started by Democritus, Dalton and Rutherford. Modern physics speaks of fundamental building blocks of Nature, where fundamental takes on a reductionist meaning of simple and structureless. Many of the particles we have discussed so far appear simple in their properties. All electrons have the exact same characteristics (mass, charge, etc. ), so we call an electron fundamental because they are all non-unique. The search for the origin of matter means the understanding of elementary particles. And with the advent of holism, the understanding of elementary particles requires an understanding of not only their characteristics, but how they interact and relate to other particles and forces of Nature, the field of physics called particle physics. The study of particles is also a story of advanced technology begins with the search for the primary constituent. More than 200 subatomic particles have been discovered so far, all detected in sophisicated particle accerlators. However, most are not fundamental, most are composed of other, simplier particles. For example, Rutherford showed that the atom was composed of a nucleus and orbiting electrons. Later physicists showed that the nucleus was composed of neutrons and protons. More recent work has shown that protons and neutrons are composed of quarks. The two most fundamental types of particles are quarks and leptons. The quarks and leptons are divided into 6 flavors corresponding to three generations of matter. Quarks (and antiquarks) have electric charges in units of 1/3 or 2/3's. Leptons have charges in units of 1 or 0. Normal, everyday matter is of the first generation, so we can concentrate our investigation to up and down quarks, the electron neutrino (often just called the neutrino) and electrons. Note that for every quark or lepton there is a corresponding antiparticle. For example, there is an up antiquark, an anti-electron (called a positron) and an anti-neutrino. Bosons do not have antiparticles since they are force carriers (see fundamental forces). 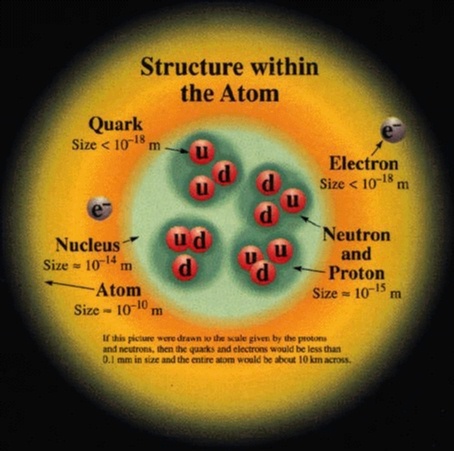 Quarks combine to form the basic building blocks of matter, baryons and mesons. Baryons are made of three quarks to form the protons and neutrons of atomic nuclei (and also anti-protons and anti-neutrons). Mesons, made of quark pairs, are usually found in cosmic rays. Notice that the quarks all combine to make charges of -1, 0, or +1. Thus, our current understanding of the structure of the atom is shown below, the atom contains a nucleus surrounded by a cloud of negatively charged electrons. The nucleus is composed of neutral neutrons and positively charged protons. The opposite charge of the electron and proton binds the atom together with electromagnetic forces. There can exist no free quarks, i.e. quarks by themselves. All quarks must be bound to another quark or antiquark by the exchange of gluons. This is called quark confinement. The exchange of gluons produces a color force field, referring to the assignment of color charge to quarks, similar to electric charge. The color force field is unusual in that separating the quarks makes the force field stronger (unlike electromagnetic or gravity forces which weaken with distance). Energy is needed to overcome the color force field. That energy increases until a new quark or antiquark is formed (energy equals mass, E=mc2). Two new quarks form and bind to the old quarks to make two new mesons. Thus, none of the quarks were at anytime in isolation. Quarks always travel in pairs or triplets.